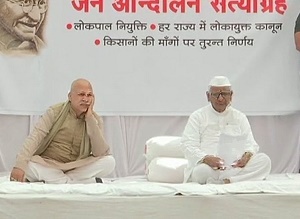 Social activist Anna Hazare began his indefinite hunger strike at his village Ralegan Siddhi in Maharashtra's Ahmednagar district on Wednesday morning. The 81-year-old anti-corruption crusader has been demanding the formation of Lokpal at the Centre and Lokayuktas in the states. Hazare stated that he doesn't want any political leaders joining the strike this time. "We don`t want political leaders with us on stage. To restrict Lokpal, they passed another law within three days, got President`s signature also on it. But to appoint Lokpal, they have taken five years and nothing has been done. We don`t want political leaders with us on stage," said the veteran activist. "Through Lokpal, even the Prime Minister can be investigated if people will give any evidence against him... Similarly, in Lokayukta a Chief Minister and all ministers and MLAs under him can be investigated if somebody gives any evidence against them. That`s why they don`t want it. No party wants it. Lokpal was passed in the Parliament in 2013, but the government is yet to appoint it," Hazare said.